Choose “Walk”, “Running Walk”, “Trot”, “Canter” or “Gallop” level giving! You will automatically receive our Partnership Benefits (click for details), (or make a one-time donation of any amount at the bottom of the page). Click here to see a list of our current partners. Your donation of any amount supports our programs including Youth Horsemanship, Therapeutic Horsemanship, Horse Welfare, and Scholarships for the Talented and the Career-Minded. Your reoccurring donation of $51 or more per month or $612 or more per year can be directed towards one of our specific Programs. If you would like to do this, please specify your choice in the “Misc” section on the payment form as one of the following: Youth, Therapeutic, Welfare, Scholarships. If no choice is indicated, your donation will go towards the use most needed. If you are currently one of our partners, and you would like to change your partnership amount, give us a call at 855-687-7273 during regular business hours. If you have questions or any creative giving ideas please Contact us. Watch Zoe As She Develops! 5* Licensed Parelli Master Instructor Dave Ellis is monitoring Zoe as she progresses in her development. 3* Licensed Parelli Professional Jerilyn Caldwell will be partnering with Zoe to do the following tasks. As each task is completed, a video link will appear to the right of the tasks for you to see. These tasks have been approved by Pat Parelli and will take several months to complete. Watch Raven As She Develops! 5* Licensed Parelli Master Instructor Dave Ellis is monitoring Raven as she progresses in her development. 2* Licensed Parelli Professional Ashley Dudas will be partnering with Raven to do the following tasks. As each task is completed, a video link will appear to the right of the tasks for you to see. These tasks have been approved by Pat Parelli and will take several months to complete. Decide on your amount and click the button below to make your donation. The Parelli Foundation is committed to disclosing any circumstance or condition related to any horse we offer for sale no matter how potentially insignificant. Surprise was treated as a yearling and again in September of 2016 for Immune Mediated Myositis (IMM). IMM is a condition in which the immune system of the horse attacks the skeletal muscles causing rapid atrophy of the muscles along the top line. It is easily visible and often occurs following a respiratory illness. IMM is remarkably responsive to corticosteroids and generally resolves without any long term repercussions. Surprise is not currently suffering from IMM. If you have questions about Surprise, her health history, or her present condition we encourage you to contact your veterinarian, contact us, or request a pre-purchase exam by the veterinarian of your choice. 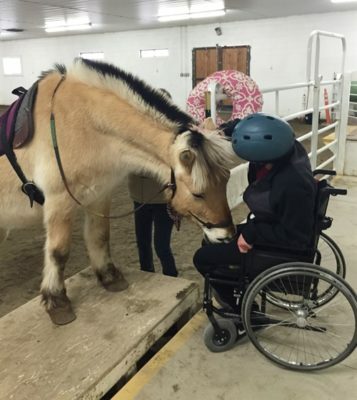 “We initially sought out Natural Horsemanship to better relate to our horses as our partners in serving the disabled. But so much more happened. We learned very soon that for this partnership to work we had to change. You have to become different in order to be successful in having this new relationship. But for someone who likes animals, especially horses, Natural Horsemanship will help them make their journey to personal strength, resiliency and finding some peace within. They will be taught from the first day that what they attempt will never be perfect.” Courage Reins is a Therapeutic Horsemanship Center. Their Instructor, Horse Enrichment Coordinator, Angie Moody works with 3* Parelli Professional Lillan Roquet. The Parelli Foundation “Rehoming 4 Life” workshop in Petaluma, California, laid the groundwork for life saving cooperation between horse rescue operations, a veterinarian, and ranches to save horses threatened by the Valley Fires in California. Through amazing teamwork, the animal hospital, rescues, and volunteers together helped rescue, treat, and care for over 300 animals. Read More…. A newly established 4-H club, Partners With Horses, has the dedication and Perspiration to practice the Parelli Principles. With help from the Parelli Foundation the club received information and inspiration getting them jump started with educational materials, tools and connections to Licensed Parelli Professionals: Meggie Andrews and Courtney Clark! This club integrates rescue horses into their program and is now having the time of their life winning ribbons at local shows! A little support goes along way.. Here is to the Future of Horsemanship!